Now, we may be closing down our Home of the Future this afternoon, but we just added another fresh product to our catalog: a brand, spanking new Microsoft Surface Pro 3. And Home of the Future is the only place you can come see it. Microsoft literally just unveiled its new, larger 12-inch tablet/computer hybrid at a New York event yesterday. It has a beautiful 2160 x 1440 resolution screen and is waaay thinner and lighter than its chunky older brother. It's lighter than the MacBook Air, which is damn impressive for something with the power of a full-on laptop. 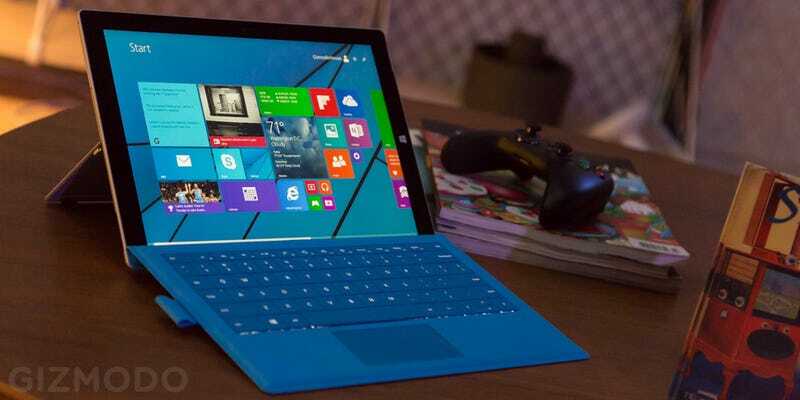 Surface Pro 3 is faster than anything else in the Surface family with the option for a speedy Intel i7 core. And it also has a new and improved Type Cover, and comes with a Bluetooth-enabled pen that lets you take notes on it as you would on a legal pad or piece of paper. It's available for pre-order now for $800. But if you want to see it beforehand, you'll have to come by Home of the Future. Today is your last chance!